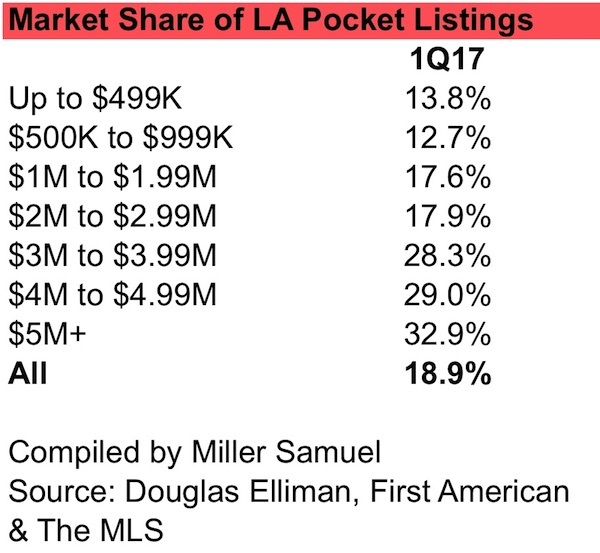 We took a look at the pocket listing phenomenon in Los Angeles. I’ve been authoring an LA housing market report for Douglas Elliman as part of their expanding Elliman Report series I’ve been authoring for 23 years. The report covers their firm’s LA footprint, namely the Westside, Downtown and other areas including Malibu. Aside from Brooklyn, this housing market is one of the most robust we covered in 1Q17. Price growth, elevated sales and sliding inventory remained the theme. We matched public record closings with properties listed on the MLS. Those sales missing from the MLS were either FSBOs or “pocket listings.” I don’t have a great way to separate the two at this point but I’m inclined to believe the higher the price, the more likely the sale was a pocket listing. The chart shows that about 19% of all sales are not shared through the MLS. But even more interesting is the pattern shown by price. Approximately one-third of all sales over $5 million are missing from the MLS.